The Stoney Gate neighborhoods have come to an agreement on a date! 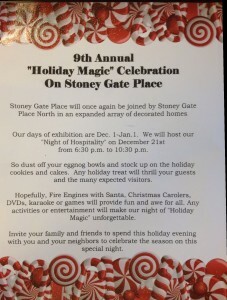 Like last year, both Stoney Gate (North and South) streets will be participating in the expanded array of decorated homes. The public days of exhibition are December 1, 2013 through Jan 1, 2014, from dusk until 10pm. Our big neighborhood celebration — open to the public — will be held on Saturday, December 21, 2013 from 6:30pm until 10:30pm. You can expect to see many beautifully decorated and lit homes, and possibly even some special treats on this date: Christmas Carolers, movies projected on houses, live shows, karaoke, games, and potentially even a fire engine with Santa Claus (no rescues pending, of course). Please join us in our neighborhoods at any time during the month of December, but especially on the 21st, when we expect the best show. 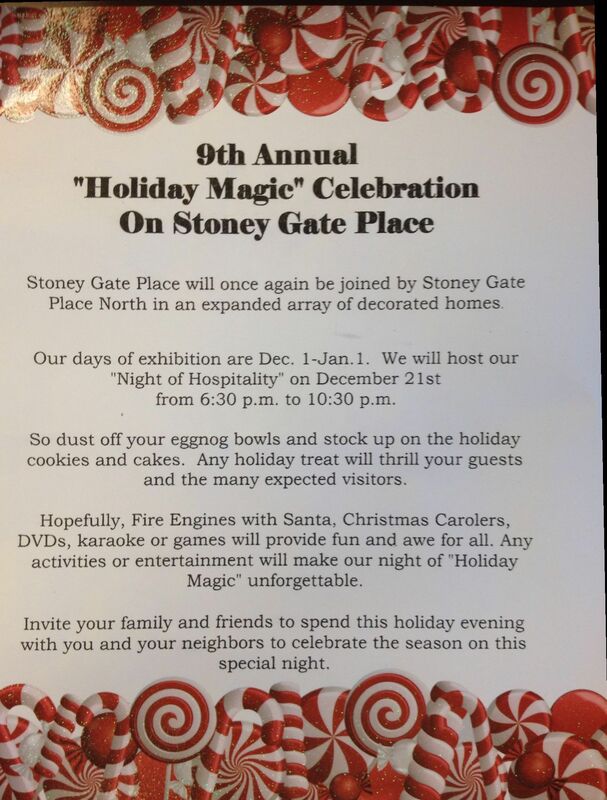 If you wish to pass out flyers, Holiday Magic 2013 Flyer. Note: there is construction on Shoal Creek Drive due to the pedestrian bridge being built, so parking may be especially difficult this year. Please plan accordingly.